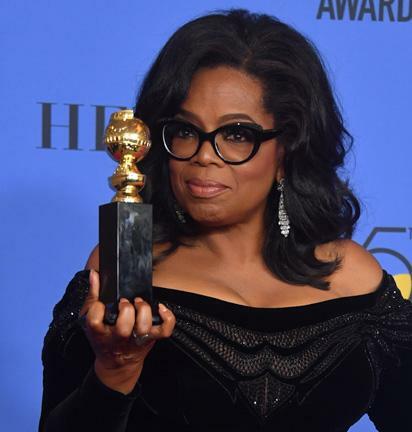 Talk show queen Oprah Winfrey’s impassioned Golden Globes speech triggered speculation about her political future. A 2020 presidential race between Oprah and Donald Trump, himself a TV titan, would be the celebrity-political battle of the millenium, made for — and by — television. But they are by no means the first American screen stars to throw their hats in the political ring. Here are some notable standouts. Prior to Trump, there was Ronald Reagan, the celebrity who achieved the greatest success in politics. Reagan earned notoriety as an actor in films like “Knute Rockne, All American,” in which he starred as football player George “The Gipper” Gipp. He identified first as a Democrat but switched parties in the 1950s. Elected twice as president of the Screen Actors Guild, the charismatic Reagan became California’s Republican governor in 1967, and won a landslide presidential victory in 1980 against Jimmy Carter. Reagan paved the way for several other silver-screened politicians, most notably Arnold Schwarzenegger. The former Mr Universe bodybuilder and star of the “Terminator” movies followed Reagan’s path to political stardom by becoming governor of California in 2003. But Schwarzenegger was born in Austria, meaning he could never serve as president. Fred Thompson, who had roles in “Die Hard 2” and “The Hunt for Red October,” parlayed his celebrity into a political career, serving as a Republican in the US Senate from 1994 to 2003. He ran unsuccessfully for president in 2008, and returned to acting. Actor-filmmaker Clint Eastwood, star of “Hang ‘Em High” and director of “Million Dollar Baby,” has been involved in political issues for decades. From 1986 to 1988, he served as mayor of Carmel-by-the-Sea, California. Perhaps the most colorful television personality to enter US politics is Jesse “The Body” Ventura, a former Navy SEAL who became a popular bad-boy wrestler in the World Wrestling Federation, watched by millions in the 1970s and 80s. His joke candidacy for governor of Minnesota in 1998 gained traction as he pushed a populist platform. Seen as a precursor to Trump’s wild win in 2016, Minnesota voters sent a message to business-as-usual politicians, narrowly electing the bombastic wrestler. Today, professional wrestling has made it to the White House. Linda McMahon, the ex-chief executive of WWE and a former Senate candidate herself, now heads the Small Business Administration under Trump. Jerry Springer became host of a tabloid-themed talk show in the 1990s, after serving as mayor of Cincinnati for a year from 1977. Springer also mulled runs for US Senate in 2000 and 2004, but did not formally enter the race. Reality TV star Sean Duffy, a cast-member on MTV’s “The Real World: Boston,” is currently a Republican congressman from Wisconsin. Sonny Bono and his pop-star wife Cher scored a huge television hit with 1970s variety program “The Sonny & Cher Show.” Bono served three years in the House of Representatives in the 1990s. Late-night comedy sketch show “Saturday Night Live” has skewered American politics for decades, but it also produced a political star. Comedy actor Al Franken narrowly won a US Senate seat in 2008, only to resign last week following multiple accusations of sexual misconduct. Two other television comedies produced members of Congress: Ben Jones, who played Cooter in good ol’ boy 1980s show “The Dukes of Hazzard,” and Fred Grandy of “The Love Boat” fame. The post From Reagan to Trump, and maybe Oprah, US celebrity politicians abound appeared first on Vanguard News.